Just before Valentine’s Day strawberries start appearing at the grocery store. I always notice the bright red berries and immediately I can taste… no… not strawberry shortcake but Strawberry PIE. This recipe is the quintessential taste of spring. The crust is lined with whole uncooked berries, which gives each bite a whole new sensation. The pie tastes so fresh it feels as if you picked the berries yourself. Then it is finished off with a topping of unsweetened whipped cream. Since the filling is sweetened and the strawberries are naturally sweet, you don’t need to sweeten the cream; it is perfect as is. I have been making this pie for years and there are never any leftovers. You might just need to make two! Plan ahead at least 4 hours before serving! The pie crust needs to rest in the refrigerator for 2 hours before you roll it out, AND once assembled, the pie has to firm up in the refrigerator for at least 2 hours before serving. It is a good idea to read through the recipe before you start making your pie. Sift the first four ingredients together in a large bowl. Add the chilled diced butter. 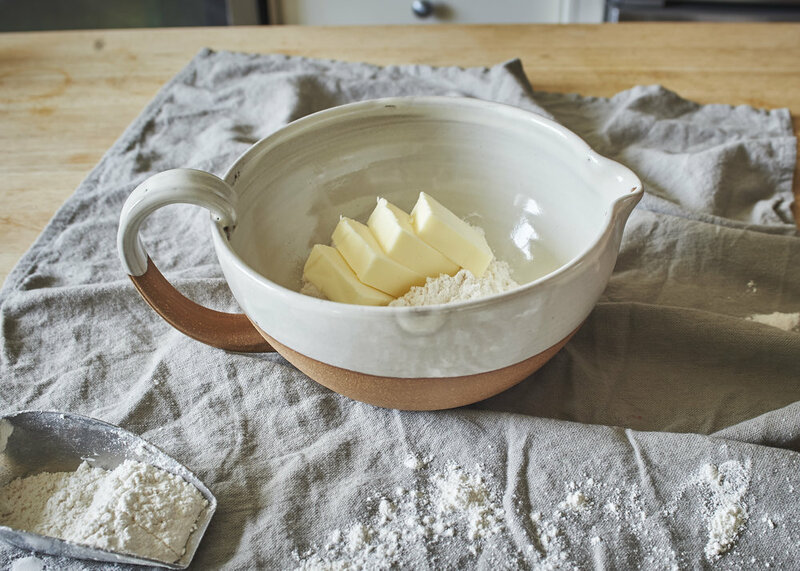 Blend the butter into the flour with your fingers until the mixture looks like cornmeal. Add the shortening and water and mix until the dough comes together in a ball. Don’t overwork. Cut the dough in half and form in to two disks. Wrap in plastic wrap and refrigerate for approximately 2 hours. While the dough is chilling, pick out 12-15 of the best-looking berries (depending on the size of the berries you may need more or less.) Place the berries in the empty pie dish to make sure they all fit. Use enough strawberries to cover the bottom of the pie but not so many that they are too snug. The berries should sit flat in the crust. Take the berries out of the dish, cut off stems, wash them thoroughly, and set them aside on a towel, stem side down to dry completely. Note: This recipe makes two crusts. You only need one on the bottom for this recipe. The extra dough will keep in the refrigerator for a day or two or you can freeze it for a couple months. *You will also need pie weights, dried beans, or rice for baking the crust. Roll out one of the disks of dough and place it in a 9” pie plate. Decorate the edge of the crust by pinching the dough between three fingers at even intervals around the entire edge. Place a piece of parchment paper or aluminum foil on the inside of the pie crust and fill with dried beans or rice to weigh the dough down while cooking. After 8 minutes take the weights out and continue to cook the pie for another 3-4 minutes. Set aside to cool. Now remove the stems and wash the rest of the berries. Place them in a food processor, pulsing a few times. Blend until most of the berries are crushed but some small pieces of berries are still visible. Place the crushed berries in medium saucepan with the water, sugar and cornstarch. Bring to a slow boil over medium heat. Lower the heat and stir until translucent. This takes about 4-5 minutes. Keep a close eye, on them so that they don’t burn. Remove from heat and add butter and cool. Once the crust and filling are room temperature you are ready to assemble the pie. First put whole strawberries in the cooled crust flat side down. Pour glaze over the berries, tilting to the left and right to make sure the glaze is evenly distributed. It is OK if the tips of some of the berries stick out of the glaze, the whipped cream will cover them. Refrigerate until firm (about 2 hours). Whip the heavy cream to your desired consistency and cover the top of the pie completely. Keep refrigerated until ready to eat.